Babaji, the immortal himalayan Mahavatar and Siddha is the reviver of Kriya Yoga in our age. My five decade journey of learning, practicing and teaching this incredible scientific art of Kriya began with a series of direct experiences with this Maha Siddha, Babaji. His wondrous path would lead me to many great souls. This is the abbreviated story of my pilgrimage with the masters and techniques connected to this noble lineage. Kriya Yoga cannot be learned from a book. My intent is to give sincere seekers a glimpse into the marvelous world of Kriya Yoga and some of its masters. My Mother was a great soul. She was my first Guru. She taught me to meditate before a candle at the age of eight. She taught me about auras, through her own direct experience. She talked about soul travel and multiple realms beyond our earthly one, where highly evolved beings dwell. She encouraged my clairaudient and clairvoyant experiences. I was filled with wonderment to learn about the great masters who have evolved beyond the wheel of rebirth, such as Kuthumi, and the Himalayan masters of wisdom. She taught me about the laws of reincarnation and karma. Most importantly, she taught me about love. In 1968, Babaji led me through an amazing series of spiritual experiences and life altering transformations. The great Mahavatar graced me with an early, undeserved darshan of his golden body. He bestowed upon me an electro-magnetic bliss-trance which lasted for hours and on a separate occasion, performed an awesome transformation of mystic surgery, when he generated a pranic whirlwind which seemed to rearrange the very cells of my body and perhaps my DNA. I was forever changed. Experiencing a gulf between my own life and the Divine realms which I sought so desperately, I cried with pain. The anguish was only healed by the descent of his Grace and my sorrow was transformed to tears of joy. In 1969, Babaji made it clear that he would send me a guru, although at the time I did not know why. Within a year, he did just that, guiding me to his great pranayam siddha-disciple, Yogiar S.A.A. Ramaiah, with whom I spent two decades. 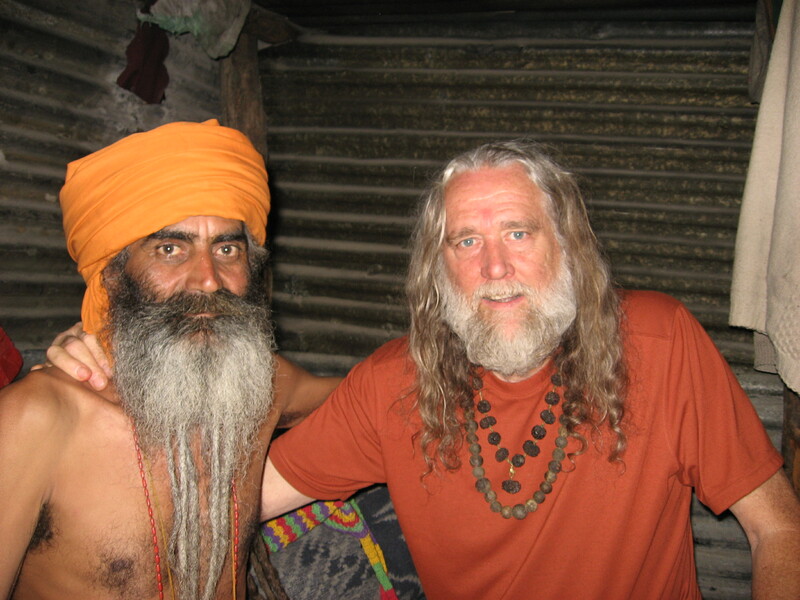 Later, Babaji guided me to his equally great tantric disciple, Swami Rudranath Giri of Tara Peeth. (For more read “Bhairavi (Breath of Ecstasy) Tantric Kriya” at Yoginiashram.com). The ancient One speaks from the inmost well-spring of stillness; the healing primordial sound reverberates from the depths. It whispers the mystic wisdom – that knowledge of Self, once established, can never be lost nor stolen. It lies beyond the reach of culture, ideology, race, and religion. It transcends environment, sense impressions, and all mental modifications. It is the only thing that liberates us from the grinding pain of the karma of past actions. It is the bliss filled oasis of light that is the inevitable eternal resting place in the pilgrimage of every soul. Kriya Yoga leads to striking charisma and increased vital energy. It is certainly a powerfully effective practice in promoting pulmonary health. Not withstanding, Kriya Yogis understand it to be their right royal pathway to inner bliss, samadhi, the birthright of all souls. 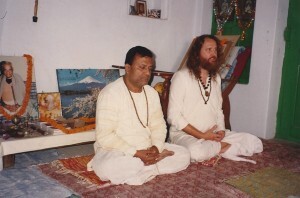 Kriya Master and Pranayam Siddha, Yogiar S.A.A. Ramaiah, demonstrates pranayam at a california beach in 1971. My first (adi) Kriya Guru, Yogiar S.A.A. Ramaiah was a pranayam siddha of the highest order. As a powerful instrument of Kriya Babaji, he was given the task by Babaji to initiate and train a small number of advanced souls into Kriya. I had the great fortune to meet Yogiar in 1969. I immediately recognized him as the one whom Babaji had sent, and in the beginning of 1970 was initiated into Kriya Yoga. 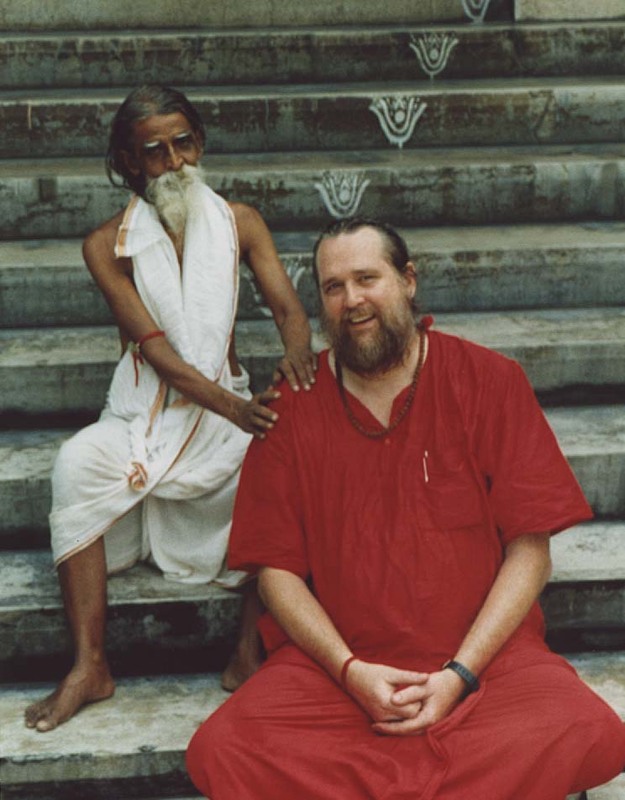 I spent more than 20 years with this spiritual powerhouse, and under his daily direction, ran various Kriya Yoga centers in India, Sri Lanka and America. When I was not traveling or living with him, we spoke weekly by phone. Through a combination of yogic practice, proximity to his energy, and the incremental descent of grace from the Sathguru, I refined my understanding of the principles and background of Kriya Yoga, the Siddha tradition, and the Siddhantha techniques that induce trance and transformation. Through the decades, I participated in dozens of specific trainings and initiations. I attended the training of newer initiates as well. 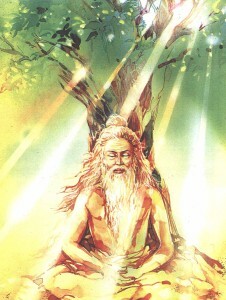 Those who sought to learn Kriya were initially taught six phases of the powerful and elegant breathing technique known as Kriya Kundalini Pranayam. It forms the core of Kriya Yoga. An integrated series of meditation techniques was also taught. The meditation series cleanses the subconscious mind and refines the subtle senses. The precise techniques must be learned from a qualified teacher, as the teachings constitute more than an intellectual understanding, and, when both the student and teacher are authorized, one is empowered by a direct transmission of the Satguru through the lineage. A different kundalini Kriya is practiced each day, though on a deeper level they are all connected. 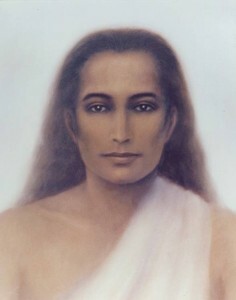 One of the main purposes of the meditation techniques is to empower the yogic practitioner to enable direct contact with Babaji. Today, at Yogini Ashram, I continue to teach these Kriya techniques which are offered to those who make a proper commitment. They are the core practices of our tradition. They are taught over several days or an extended weekend intensive. After a successful period of 64 days of practice, the student is checked for sound practice, and a final technique is given that rounds out the training and enables the individual to practice Kriya Yoga with a level of independence, returning when required for clarification or if the Kriya Yoga Sadhak requests additional advanced courses. These Kriyas are part of 144 techniques plus a very special technique, pranayam by the Phases of the Moon. Yogiar taught the advanced techniques to only a small handful and even fewer received the method of Pranayam by the Phases of the Moon. Only one blessed soul, Shivagami, received the crown jewel, the Babaji Kali Chew Mantra, who transmitted the sacred mantra to me prior to her maha samadhi. After many years, I was recently guided to initiate Swami Premajyoti Saraswati into the Kriya mantra of the Divine Mother Kali which came directly from Babaji through Yogiar’s maternal grandfather. Through Babaji’s grace, the seed has fallen on fertile ground and continues to grow exponentially. 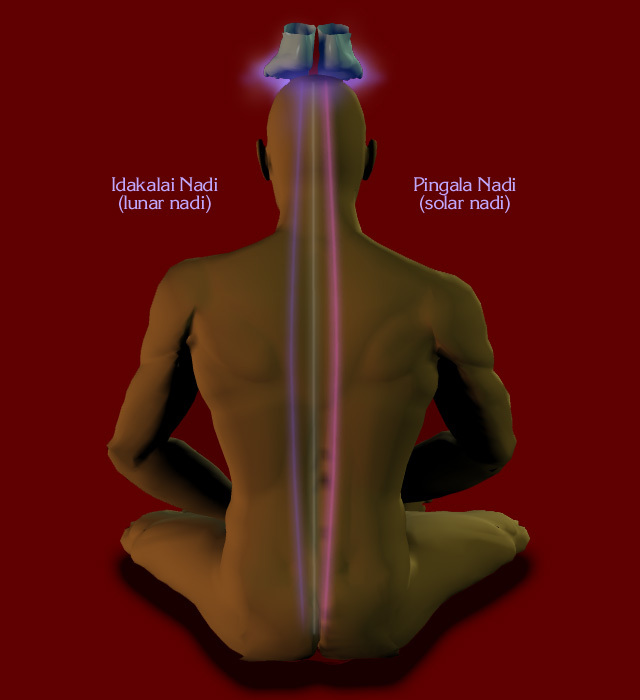 Illustration of the primary energy channels (nadis) of the Kriya Technique. 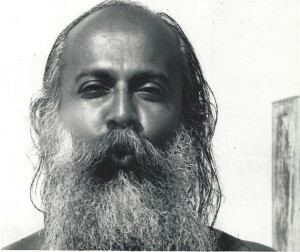 The core techniques of Babaji’s Kriya Yoga, whether from the lineages of Lahiri Mahasaya, Yogi Ramaiah, or Swami Sivananda, operate somewhat on the same principles. Revolving around the central staff of latent consciousness, the practice envelops the primary channel in an electro-magnetic force and prepares the inner centers and subtle bodies for an expanded Self awakening. This invariably leads to the development of ones subtle senses, the expansion of ones auric field, and massively increased focus on the primary goal of life, the realization of the indwelling Self. The resultant contentment, charisma and singular focus benefit every aspect of ones life, whether familial, social, or professional. Swami Yogananda soon after arrival to America in 1920’s. The ancient siddha Tirumular, outlined Kriya Yoga in the 5th century in his classic text Tirumandiram. The ancient sage Tirumular is rightly understood to be one of the greatest Siddhas the world has ever known. Based upon direct experience, his teachings were elaborated upon in his great work, Tirumandhiram, a text completed in the fifth century. The sacred text unifies Advaita Vedanta with Siddhanta and elucidates the path of harmony between tantra and yoga. Therein, Tirumular discusses the four steps of spiritual progress; Charya, Kriya, Yoga and Jnana. He wrote about the core technique of Kriya as follows. Thus we see that the wisdom of Kriya collectively emerges from the ancient Siddhas who discovered that there is powerful cosmic consciousness within every soul. At the root of the vital body (which they called prana-maya-kosham) the awakening force of that consciousness resides as Kundalini Shakti. She is perceived as the feminine power within and can become active by the scientific art of mastering the breath-energy, in concert with other practices. The siddhas have expounded the method of controlling thought and energy by first influencing breath, as it is under more conscious control than the subtle energies and thought forms of the mind. The system of techniques that bring about that process is called Kriya. Experience has shown that these spiritual actions (Kriyas) bring a metamorphosis into the life of the Yogi. These Kriya keys open the practitioner to an ever expanding experience of bliss and light. With consistent practice, one attains glorious radiance; physically, mentally, and spiritually. The body becomes sweet as sugar cane and the aura charged with pranic energy. This enables more dynamic blissful meditations and the conscious projection of power for the physical, psychic, and spiritual health and well being of both the Yogi and those who seek the knowledge and energy from them. Through continued practice, the charisma around the yogi increases and this auric field positively affects even those upon whom the advanced Yogi mentally reflects. Through the grace of the Sathguru, the ego is kept under check and therefore does not pollute the transformation and channeling of wisdom. The breathless state of communion with God ensues and divine vibrations expand out to all beings. This amazing Kriya practice is one in which the five elements, in addition to the mind, intellect and ego, are gradually dissolved into a broader consciousness. This state the yogis call samadhi. The Siddha Patanjali articulated Kriya Yoga in the 2nd century. Kriya is both a specific set of practices, as well as a broad system. The great Siddha Patanjali, who authored the Raja Yoga Sutras around the second century, advanced the understanding of Kriya Yoga by giving it an outline which it generally retains today. He described a path containing eight limbs. One begins with restraint; from violence, dishonesty, theft, sexual excess and attachment. Beyond that are moral observances including the development of purity, contentment, introspection, and self-surrender. From there, one progresses in the practice of physical postures, control of the breath, withdrawal of the senses, ultimately reaching a capacity for focused attention on a single object. The final steps are contemplation and realization of non-duality. In Chapter three of his famous text, he discusses Kriya Yoga, the yoga of “practical action”. Kriya is a specific set of practical techniques directly impacting the primordial energy at the base of the spine in the subtle planes and is directly linked to kundalini pranayam. This kundalini pranayam is an extraordinary integration of breathing techniques which awaken the primordial energy. It is about this transformational event that the great saint Yogananda quoted the Bhagavad Gita, wherein Krishna tells Arjuna, “Offering the inhaling breath into the outgoing breath, and offering the outgoing breath into the inhaling breath, the yogi neutralizes both these breaths” (ie, neutralizes ida and pingala channels); he thus releases the life force from the heart (hridaya) and brings it under his control. One is progressively taught the techniques of trance and transformation with an opportunity to practice the kriyas in an environment of support until the yogi is fully familiar and able to internalize the process. 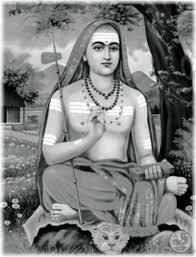 Adi Shakarachaya was initiated into Kriya Yoga by Sathguru Kriya Babaji. He had other gurus as well. Sir John Woodroffe at the Temple of the Sun, Orrisa. He described the Kriya Technique. Sir John Woodroffe was a British orientalist and Advocate-General of Bengal. During the decades of the late 1800’s and early 1900’s, he translated and provided commentary on many important works on Tantra and is still considered one of the most influential tantric scholars over the last century. Although he served on the Indian High court for nearly two decades, a much higher achievement was the elevated texts that he compiled over his lifetime, which showed that he had direct experience and was not just limited to scholarship. In his Introduction to Tantra Shasta he gives a brief description of the Kriya technique… “Details of the practice can only be learned from a guru” he says. “but generally it may be said that jivatma (individual soul)…is united with the kula kundalini by giving a left-ward revolution (as viewed from above and behind, the recognized seat of the Self) and the fire which is around kundalini is kindled”. Kriya Yogis would immediately understand the meaning of his words which describe the core technique. Kriya of course has not always exclusively been called “Kriya Yoga.” Babaji renamed it “Kriya Yoga” for this age. 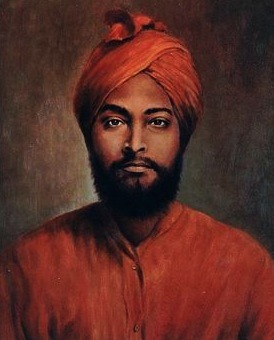 Yogananda writes: “Kriya Yoga is described in certain scriptures as Kabali Pranayama” (or Kevali Pranayama, or Kevala Pranayama, according to dialect. “Kevala” means “alone”, referring to the Self). “Kabali Pranayama was considered to be the greatest of all techniques in controlling prana (life force).” Contrary to some explainations of pranayam, Kevala is not premature and excessive holding the breath, but the natural absorption into divine energy, precluding the need to breath. Babaji, speaking through Yogiar, made that perfectly clear. No one ever attained samadhi by holding the breath. One has to grow into the inner beatitude by which breathing is not required. Patient calm persistence is far more effective than frantic unnatural attempts at holding the breath. Kriya, performed as instructed, scientifically leads the devotee to breathlessness. “Breathlessness is deathlessness.” The result is Cosmic Bliss. “Kriya is an ancient science,” Yogananda writes. Mahavatar Babaji rediscovered and clarified the technique after it had been lost in the Dark Ages. 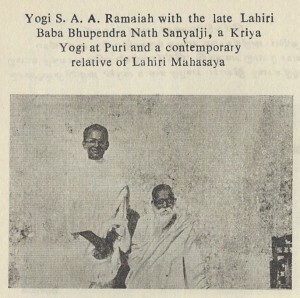 Kriya Yogi Salindranath_Mukherjee & Swami Ayyappa weeks before his Mahasamadhi. 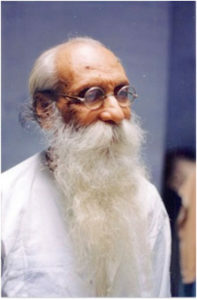 Sailendranath Mukherjee was a householder Kriya Yogi and disciple of Baba Bhupendra Nath Sanyal, who was himself a disciple and blood relative of Lahiri Mahasaya. 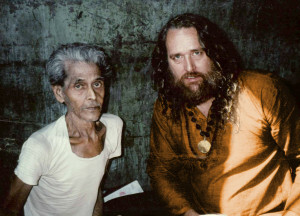 In the 1980’s, Sailendranath Baba asked me to come quickly to his home in Calcutta. I did not understand the haste at the time but after he transferred to me a comprehensive training of Kriya as taught in the Lahiri lineage, he passed away. I felt greatly blessed by Lahiri in the contact. 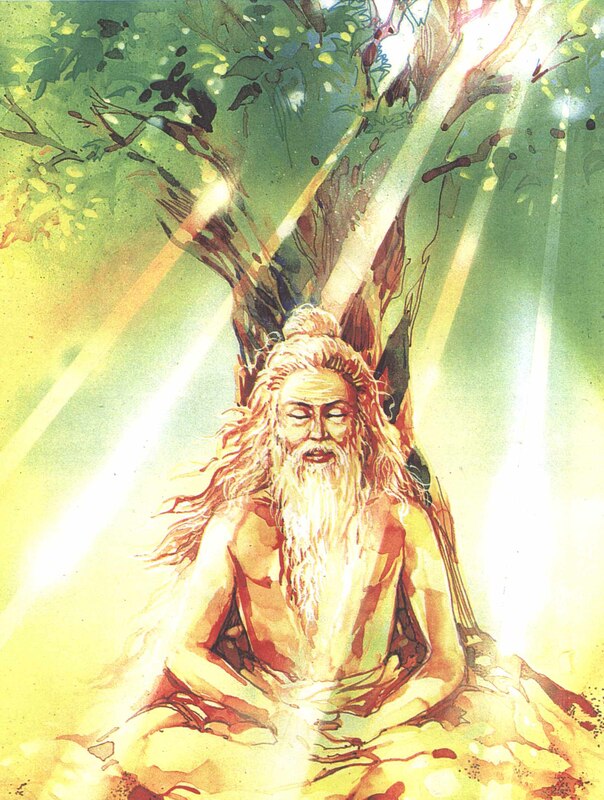 Thus, I became connected with the great energy that Lahiri Mahasaya, who continues to shine upon me from the subtle planes. Yogiar (standing) in early 1950’s, a rare image before he grew his beard. He stands next to Bhupendranath Sanyal. Due to my Kriya initiations by Salendranath, Bhupendranath becomes my upa Guru. Jai Babaji! My first Kriya Guru, Yogiar, had taught me that the cosmic personality of saints can be experienced in stillness. As one develops the subtle senses and psychic abilities, these experiences occur even in the midst of world activity. Interestingly, my diksha guru, Yogi Ramaiah, had established a personal friendship with Bhupendra Nath Baba years before. 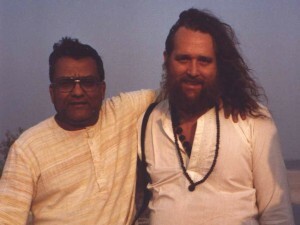 (see attached photo of the two of them from his book, “Songs of the Siddhas”) These connections between spiritual generations are more evidence that when one steps onto the spiritual path with sincerity, apparent “chance” occurrences reveal their place in the grand plan. Kriya Yogis Chandra Sekar and Swami Ayyappa formed a silent bond. 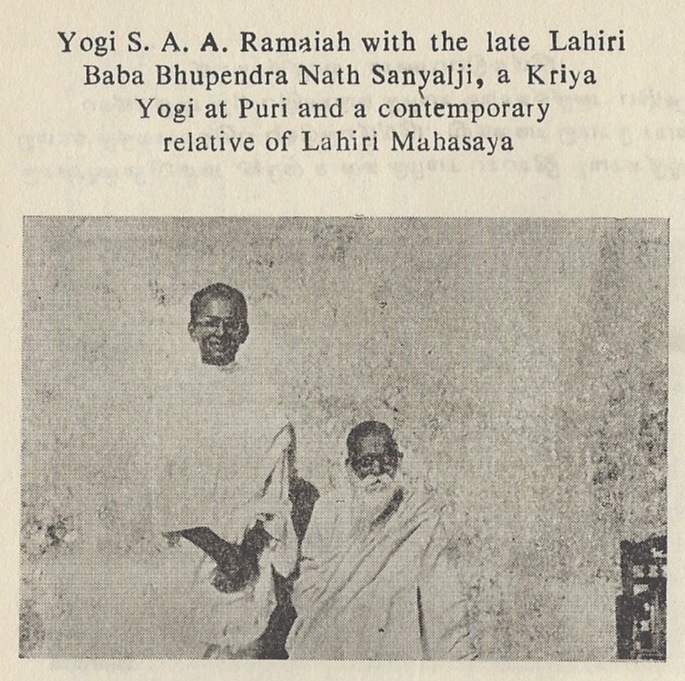 Secret Yogi and master of the Lahiri Lineage, Sri Banmali Lahiri, who resided in the ancestral home of the Great Master, Lahiri Mahasaya. During a short period in the late 1980’s, I enjoyed the extensive darshan of one of the greatest secret Kriya Yogis of India, the late Yogiraj Shri Banmali Lahiri. The Maharaj did not generally allow photographs, and he would certainly be angry with me for calling him Maharaj while living, yet he was very much that. Apart from his monumental achievements as a Yogi, he was a professor at Benares Hindu University, and was blessed with a pension that allowed him a freedom to plunge into sadhana in his later years. He was the great-grandson of Lahiri Mahasaya and it was explained to me that he was initiated into the spiritual path of Lahiri by the wife of Lahiri Mayasaya, when Banamali was quite young, as well as Yogi Tinkori Lahiri. The exact dynamics of these two initiations are unknown to to me, but it is at least likely that he received shakti pat from (name of wife) and the full initiation and ongoing instuctions from Yogi Tinkori, who was the eldest son of Lahiri Mayasaya. I knew from other Kriya Yogis that he was a powerful soul and I was excited to be able to be going to meet him. With anticipation, I worked my way through the narrow lanes of Varanasi and found the doorway to the ancestral home of Lahiri Mahasaya. Hardly breathing, I knocked on the door. In due course, an upstairs window opened, from which emerged a magnificent head with piercing eyes, sage like face, long grey hair, and cascading beard. His head seemed to fill the window. “Why are you here?”, the saint bellowed, as though I had broken some unstated law. “I am here to see your holy self, sir”, I answered. “Come back at five”, he retorted. Although disappointed, I was immediately resigned to return. Dutifully arriving at five with my companion, Swami Mantra-dikshananda (Shivagami), I knocked and his wife let us into the home. A modest hallway led to a staircase. I could hear the yogi upstairs, bustling about. His wife led us to a shrine room area just to the right of the entrance. She pointed out a platform, nestled in the corner, upon which Lahiri Mahasaya would meet with his students. A small shrine table was positioned at the opposite end of the shrine room. The energy in the room was electric. The presence of the great Yogi, Lahiri Mahasaya, who for years lived in this home and held darshan in this very room, felt palpable to me. I was pulled into meditation by these divine currents. After some time the energy abruptly quickened. I did not have to open my eyes to know that Banamali Baba had just entered the room. I was familiar with that experience after two decades with my guru, Yogiar. As I opened my eyes, he greeted us and then began to chastise me for sending him letters that were tainted with ego. He was right, of course. He knew the secrets of my soul, and in moments, he elicited tears of regret for my lapses, which he and I alone could understand, or so I thought. At one point his wife interrupted him and immediately his tone softened. To my relief, the remainder of his darshan was sweet. Had he really been angry, or like my guru Yogiar, was he just a great actor and a warrior against the subtle ego? I decided that he was indeed a warrior. During our meeting, much of what he spoke about is too personal for me to share in this forum. Suffice it to say that he was highly clairvoyant. He was an old soul who had spent many years, probably many lifetimes, as a Kriya Yogi. Very few people knew that this grand secret yogi was a Jnana Siddha. He did not seek students, perhaps because he had indirectly influenced the soul development of many who trickled into his famous home. In just two days, he introduced me to previously unknown levels of consciousness just by the energy of his presence. With even more humility and appreciation for him leaving than arriving, I touched his feet, a sign a reverence and appreciation for his divine power, passed through the sacred doorway, and joyfully melted into the bustle of humanity, reflecting on the power of grace. Sadhana with Great Grandson of Lahiri Mahasaya, Shebindu Lahiri. 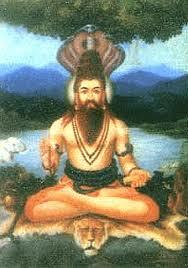 Like Banamali, his cousin Shibendu, also the great grandson of Lahiri is a Kriya Yogi. I visited Shebindu Lahiri several times in the 1980’s. We did sadhana together and he showed me the sandals worn by Lahiri Mahasaya, which he lovingly treasures and protects. He is a worthy instrument of his great grandfather. It has been reported to individuals closely connected to the Saraswati lineage that after Swami Sivananda was initiated as a Sannyasin by Swami Viswananda Saraswati in the early 1920’s, Swami Sivananda plunged into a period of intense Yogic tapas which lasted for many years. In due course, Mahasiddha Babaji initiated Swami Sivananda into Kriya Yoga, an event that is thought to be sometime in the mid or late 1920’s. Other saintly disciples of Sivananda, such as Sivananda Radha Saraswati, are reported to have had direct experiences with Babaji as well. The practice in this Sivananda lineage of Babaji’s Kriya Yoga culminates in twenty extraordinary powerful Kriyas, which were passed on to his disciple, Swami Satyananda. One difference between these kriyas and the kriyas taught in the Lahiri tradition and by Yogi Ramaiah is that the mental circumambulation movements occur in the sagittal plane rather than the coronal plane, utilizing the arohan and awarohan nadis. This means that instead of using channels (nadis) which are situated to the right and left of the spinal column, the channels are in the front and behind the spinal cord. In this way, the techniques remind one of the macrocosmic orbit of the Taoist tradition. The end result of all these Kriyas is similar. The central column becomes electro-magnetized and soul advance is rapid. In teaching these Kriyas, Swami Niranjananda, is performing a great service to the souls receiving the knowledge thus honoring this grand lineage of the Saraswati order and his Guru lineage. The Bihar School of Yoga reports that Swami Satyananda Saraswati was initiated into Kriya Yoga by Sivananda in 1956. It is my understanding that Swami Satyananda rarely mentioned Babaji in his lectures or books, however, and had stated that the Kriya techniques were taught to him in less than an hour. Decades ago, I was introduced to this Sivananda lineage, which culminates in twenty kriyas of great power. These Kriyas form a climax of the training in Kriya. I practiced the techniques for many months, and can attest that these kriyas are unique and powerful. 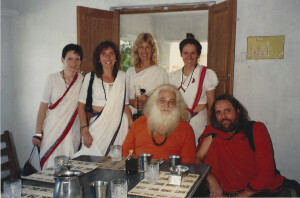 Later, in 1988, I visited the Bihar School of Yoga and met with Swami Niranjananda, the successor to Swami Satyananda. We discussed Kriya and other aspects of yoga. I found that Swami Niranjananda was knowledgeable, warm and humble. In the Kriya Tantra Yoga training taught by Yogini Ashram, these twenty kriyas, reported to have been given by Babaji to Swami Sivananda, have always been a part of the advanced Yogacharya training. I first met Swami Gitananda in Colombo, Sri Lanka, during 1971, where he participated in a Guru Poornima Celebration, which I had the pleasure to organize. I was amazed to see that Swami Gitananda’s expanded aura easily filled the hall. I marveled that his consciousness was highly elevated yet he was always grounded to the earth. He was fearless, beautifully non-controlling, and absolutely concerned with the welfare of all who approached him. I met his lovely and divine wife in those early days as well and was glad to be able to advise her on temporarily settling in Sri Lanka. Swami could spot a spiritual fraud a mile away. I had darshan with him many times, and each time, I learned something. He was a true master of Ashtanga Yoga. 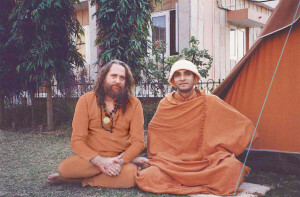 Swami Om Giri was born in an aristocratic Delhi family. His exceptional environment and education was reflected in his impeccable Hindi. As a young man, he simply renounced all worldly things, receiving initiation in the Juna Akhara Naga Baba tradition in Haridwar. From there he migrated to the source of the Ganges. There he lived for decades in the snows of Gaumukh, without clothes. Each morning he bathed in sacred water from the melted Glacier. This requires much more than will power. It requires siddhi, which he most certainly had in abundance. I spent time with the great Baba when I was in the Gangotri area. Through Babaji’s grace, he taught me kundalini practices that alter the pulse and breathing rate. The connection was genuine and rich. At one point he told me that whatever challenges I was facing would be overcome if, in faith, I would mentally the words, “Om Giri” with focus, thinking of him. Subsequently I have found that just thinking of him gives power. He was an amazing instrument of Sathguru Kriya Babaji. Reading about Kriya Yoga will not advance the soul one iota. One must learn and practice the techniques to benifit. There are a number of expressions of Babaji’s Kriya Yoga. For those sincere souls who are drawn to us at Yogini Ashram in California for this great transmission and training, a course is held at regular intervals. I encourage you to take that step for your own personal growth. Send me an email at ayyappa108@aol.com and express your interest in Kriya. Interested in Kriya? The Initiation and training in Babaji’s Kriya Kundalini Pranayam course will be offered in Rishikesh, India on 23 April 2018. Join us! The tuition donation to register for the course is $27.00. After this, you may donate what you may donate further at the time of the course. Dear Sir, I am interested in learning Kundalani Krya Yog . Please tell me when you are going to have workshop or shivir . Dear Ashish – An initiation CLASS UPCOMING IN RISHIKESH, INDIA In Babajis Kriya Tantra Yoga, the initial step is initiation into his Kriya Kundalini Pranayam. These are the important core practices of the tradition.